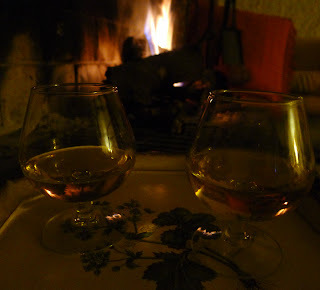 On these long, cold winter’s nights, what’s needed are a cozy fire, good friends and a warming liqueur. Even the name in Spanish—aguardiente, "fire water"—suggests its purpose. 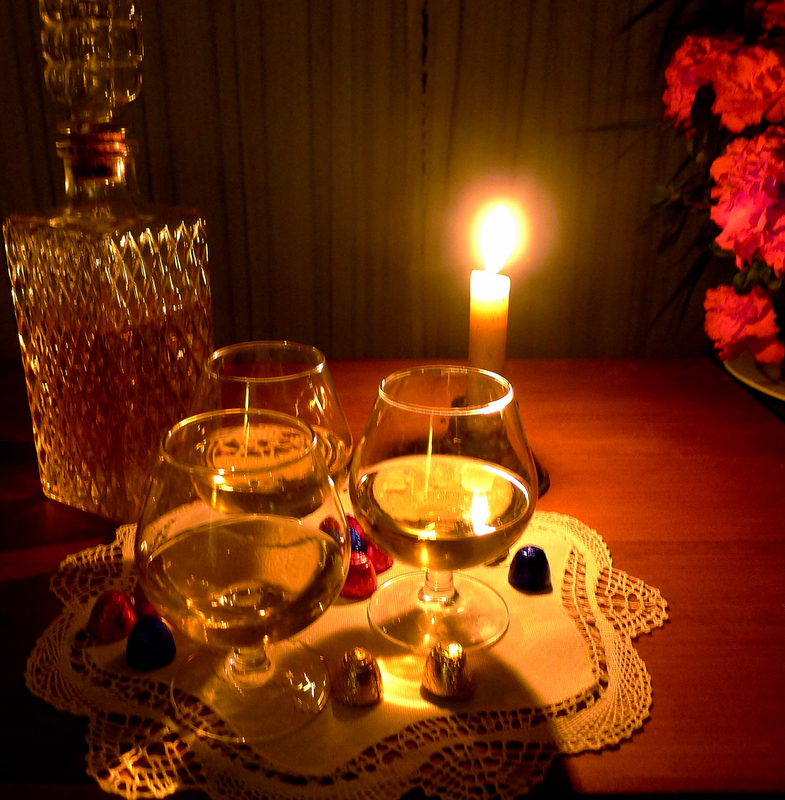 Aguardiente is distilled liquor. In Spain, with its extensive vineyards and wine production, aguardiente is distilled from wine or grape pomace. In Galicia, aguardiente de orujo is a clear, dry grape brandy, somewhat like French marc or Italian grappa. It can be flavored with herbs, aniseed or coffee beans and sweetened with sugar. In Navarra, sloeberries are macerated in anise aguardiente, to produce pale ruby pacharán, a favorite digestive. Aguardiente is also the starting point for Brandy de Jerez, mellow brandy aged in Sherry casks. The most common flavoring for aguardiente is aniseed. It is produced as both a dry liquor, often consumed diluted with water, and as a sweet liqueur. But it is in La Mancha, the heart of Spain, with the most extensive vineyards on earth, where the greatest variety of distilled liqueurs are made. Most of them are home-brews or secret concoctions of monasteries. Such are resolí, a coffee and spice liqueur; místela, a spiced sweet wine fortified with aguardiente, and licor de trasnochá, late-night liqueur, a sweet liqueur with orange and aniseed flavors. Orange and spice infused liqueur. Start this liqueur now and it will be ready for Valentine’s Day. Heart-warming stuff. Use your best cut-glass decanter to present this liqueur. It is sweet, but not insipid, and aromatic with orange and spices—a fine after-dinner drink sipped neat in snifters or tiny liqueur glasses. The liqueur can also be mixed with seltzer water and ice for a tall drink or used to concoct a Spanish cocktail. Remove the orange zest with a vegetable peeler in a spiral. Trim off any of the white pith. Leave the strips of zest to dry for several days to concentrate the essential oils. 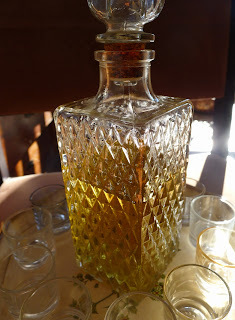 Use unflavored vodka or grappa for the alcoholic base. 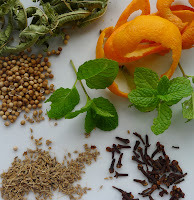 Once the orange-spice mixture is combined with the alcohol, the liqueur infuses for 2 weeks before being strained. Take care to use very clean utensils, jars, and bottles. Aromatics to flavor the liqueur. Allow the orange zest to dry, about 4 days. Combine the sugar with water in a saucepan. Bring to a boil and stir to dissolve the sugar. Add the orange zest, aniseed, coriander seed, and cloves. Cook gently for 5 minutes. Remove from heat and add the mint, lemon verbena and orange flower water, if using. Allow to cool for 20 minutes. 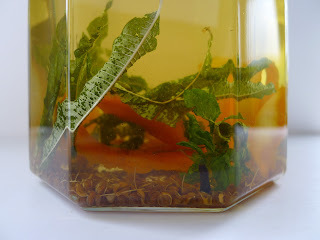 Steep spices and herbs in alcohol with sugar. Place the sugar syrup with orange zest and spices in a clean glass jar (divide between two jars, if necessary). Fill with the vodka. Cover tightly and leave in a cool, dark place for 2 weeks. Strain the liqueur into a pitcher and discard the solids. Fit a coffee filter paper into a filter. Pour 1 cup of boiling water through it. Discard the water. Place the filter over a bottle or decanter and pour in the liqueur. It will filter through very slowly. Continue adding liqueur to the filter until it has all been filtered. Use 2 bottles if necessary. Cap or stopper the bottles tightly. The liqueur is ready to drink, but can be kept in a cool, dark place for up to 1 year. 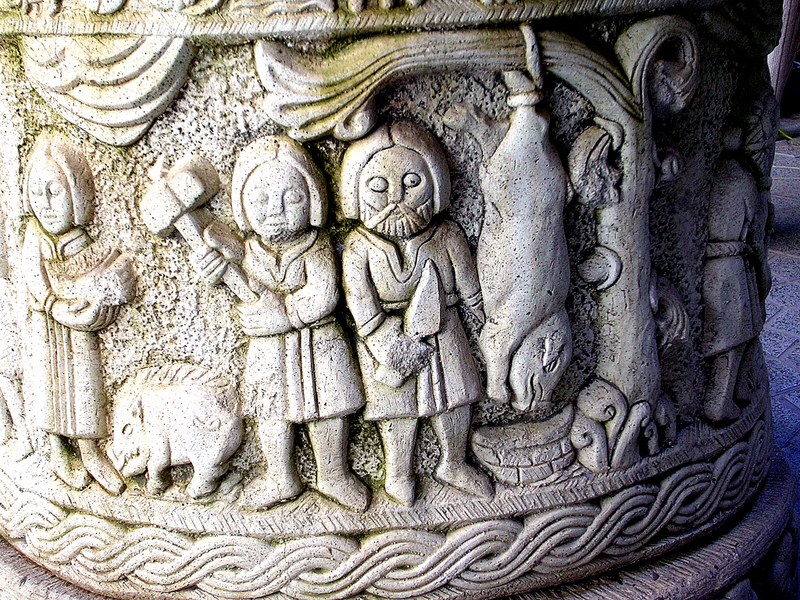 Bas-relief on a well in the courtyard of a house in a small La Mancha town, depicting the matanza, or slaughter, of a hog. Before the sun is up the men start a big fire to heat a cauldron of water. They are all drinking strong anise brandy, to ward off the chill and, possibly, to prepare themselves for the sacrifice. (In Spanish, the verb is sacrificar.) By the time the first rays of sun glisten on frost-covered hills, the water is boiling. A huge pig is tethered to a post. 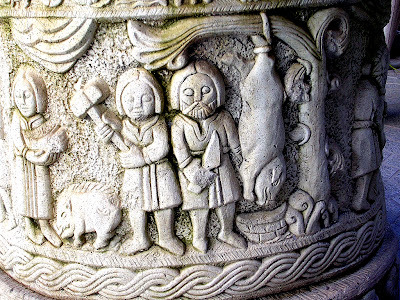 It takes six guys to heave the pig up onto a curved stone, where it hangs with legs dangling over. Then it happens very fast. The butcher slits the pig’s throat. A bucket is ready to catch the blood spurting out. A woman plunges her arms into the bucket up to her shoulders, to stir the blood and keep it moving so it does not coagulate as it cools. Steam and mist swirl around her. The men use the boiling water to scald the pig, then scrape the bristles. They cut off the pig’s head, then hang the carcass from a beam. Knives are sharpened on steel. They slit open the hog’s belly and the innards fall into a trough. The women carry off the stomach and intestines to be scrubbed and soaked. They will be used as casings for sausages. The liver is cut up to be cooked for the midday meal. The pig will be butchered the following day, when it has cooled and aired. Then the fatty belly meat is chopped and mixed with spices for chorizo sausage. The two hams are hung in preparation for salting. The prized tenderloin is cut free. The whole loin is boned and marinated in vinegar with spices to preserve it. The men sling slabs of fat over their shoulders and carry them away to be salted down in wooden troughs. Other fat will be rendered down to white lard. Some of it goes to bakeries, which make tender-crumbed cookies with it. 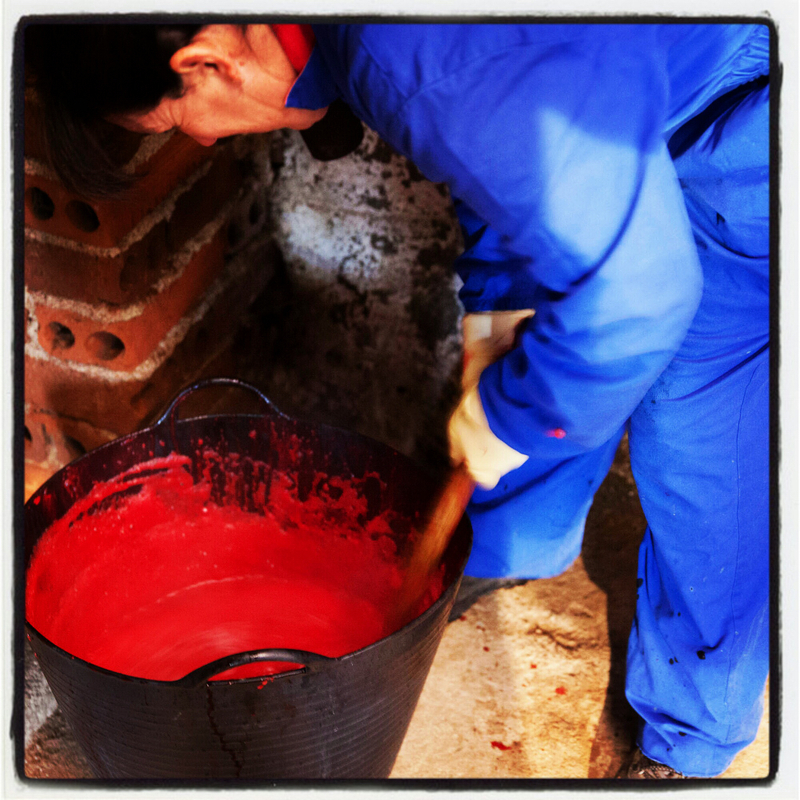 Some lard, flavored with red pimentón, is used to pack pieces of cooked meat in clay jars, to be kept in conserve. Once the fat solidifies, it protects the meat from the air, a sort of confit. Once the meat is cut up, the women start the sausage making. The blood is gradually combined with a mixture of cooked rice, onions, spices and chopped pork fat. Using a big sausage funnel, they stuff the casings with the mixture. Once stuffed and tied off in links, the sausage is boiled in caldrons, then drained and hung from poles to dry for a week. The cold, dry air of January is perfect for the traditional matanza—hog slaughtering. It used to be that every country family fattened up a pig or two for the matanza, producing fresh and cured meats to last for months. Nowadays the practice is highly regulated, requiring veterinarian inspections and authorized butchers. Nevertheless, small communities throughout Spain keep up the tradition. Traditional sausages, such as morcilla, are produced industrially as well. Four types of morcilla, clockwise from the top: morcilla de Burgos, with rice; morcilla from ibérico pig's blood and fat; Andalusian onion morcilla, and, on the left, smoked Asturian morcilla. Morcilla means “blood sausage,” also known as black pudding and budin noir. In Andalusia, it usually is a sweet-spicy (cinnamon and cloves) sausage with onion, while the famous Burgos morcilla is made with rice. Asturian morcilla, an ingredient in fabada bean dish, is smoke-dried. Most morcilla is seasoned with smoked pimentón (paprika), garlic, salt, pepper and oregano. 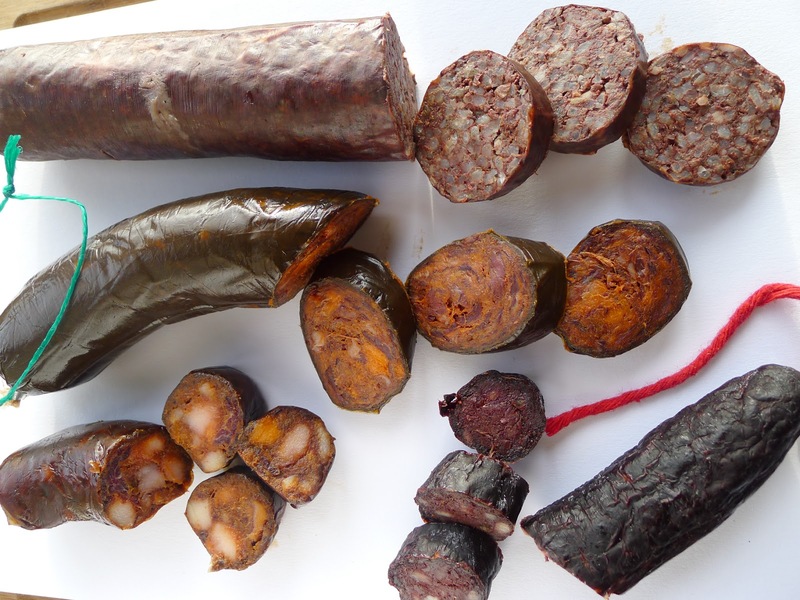 But, morcilla doesn't always denote a blood sausage, says Jeffrey Weiss, whose book about Spanish sausages, Charcutería: The Soul of Spain, will be published in the fall of this year by Agate Publishing. ”Morcilla is just an old word for sausage, and in the further reaches of Spain, it’s still used as such,” Jeff explains. “An example of the non-bloody variants I've come across are the Extremeñan morcilla patatera and morcilla de calabaza. ”These northern Extremeñan faves--though called ‘morcilla’--don't include blood. 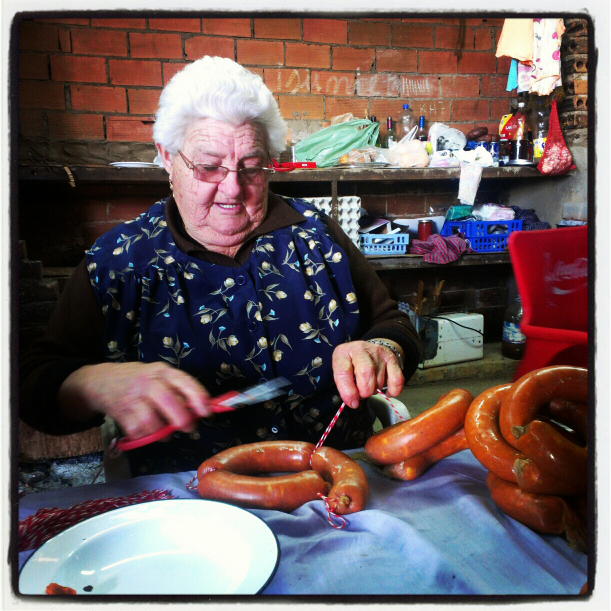 Instead, they are pork-fat bombs (up to 40% of the recipe by weight is pork fat) laced with a lot of cooked, starchy veggies (the patatera is all about potato, the morcilla de calabaza all about pumpkin) and spices.” A sabia, a woman experienced in sausage making, seasons the sausages. Jeffrey and photographer, Nathan Rawlinson, are currently on location in Spain, getting a lot of first-hand experience at matanzas. The photos, above, by Nate (used with permission) were taken at a matanza in Lozar de la Vera (Extremadura, western Spain). 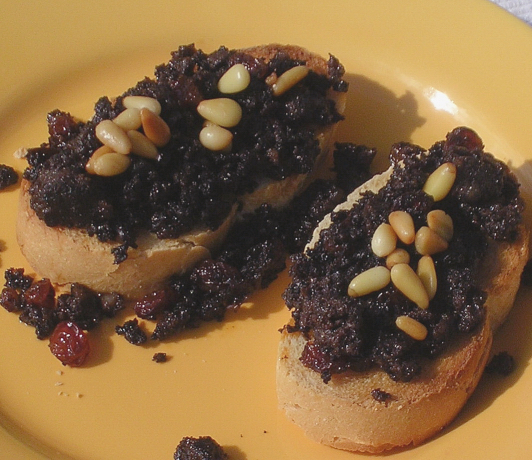 In Spanish cooking morcilla is usually added to cooked dishes such as potajes (see the recipe for bersa and the recipe for potaje de San Antón). It’s also delicious sliced and fried with eggs and potatoes or cooked on the grill with other meat. In an old Madrid tapa bar, I tasted a tapa of morcilla de Burgos fried up with pine nuts and raisins, heaped on a platter and served with chunks of bread. In another tapa bar, fried slices of morcilla were speared on picks with chunks of pear, a nice contrast. Morcilla with raisins and pine nuts. Use morcilla made with rice. If you are substituting another type of blood sausage, add about ¾ cup of cooked rice to the skillet with the sausage. At the tapa bar, the morcilla was served heaped on a platter placed in the center of the table accompanied by forks and chunks of bread. We all helped ourselves straight from the platter. At home I serve the morcilla atop salad greens or, as a tapa, heaped on toasts. Serves 4 as a main dish or 6 to 8 as a tapa. Heat the oil in a skillet and fry the pine nuts until golden, 45 seconds. Tip the skillet so oil flows to one side and skim out the pine nuts. Add the morcilla and raisins and fry 3 minutes. Use a wooden spatula to break the morcilla into smaller pieces. Add the wine and simmer 5 minutes until morcilla begins to sizzle again. Spoon the hot morcilla onto salad greens or spread on toasts. Scatter the pine nuts on top. 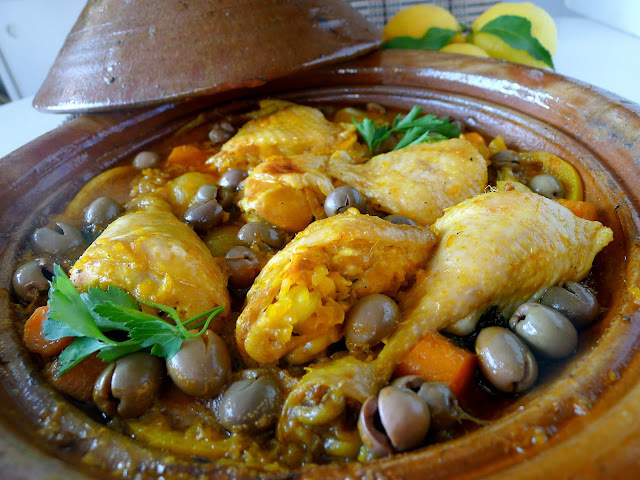 Chicken cooked in a tagine with fresh lemons and olives. Did you see the sunset photo I posted at the end of last week’s blog? 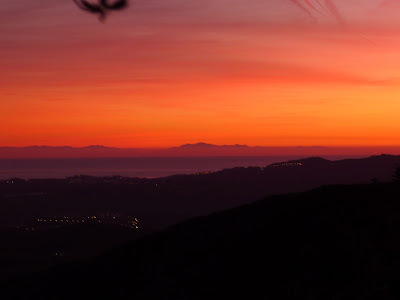 It didn’t have anything to do with cooking, but it was the view from “my kitchen in Spain,” looking south, across darkening hills, across Mediterranean waters mirroring the sun’s red glow, to the horizon, the hills of North Africa. Morocco. Another continent. So near and yet so far. That sensation inspired me to get the Moroccan earthenware tagine off the high shelf and pull out a recipe from Paula Wolfert’s new book, THE FOOD OF MOROCCO (ECCO, 2012), for kefta tagine. Kefta are spiced meatballs cooked in the tagine with nothing more complicated than grated onion, spices and water, yet the flavors are extraordinary. 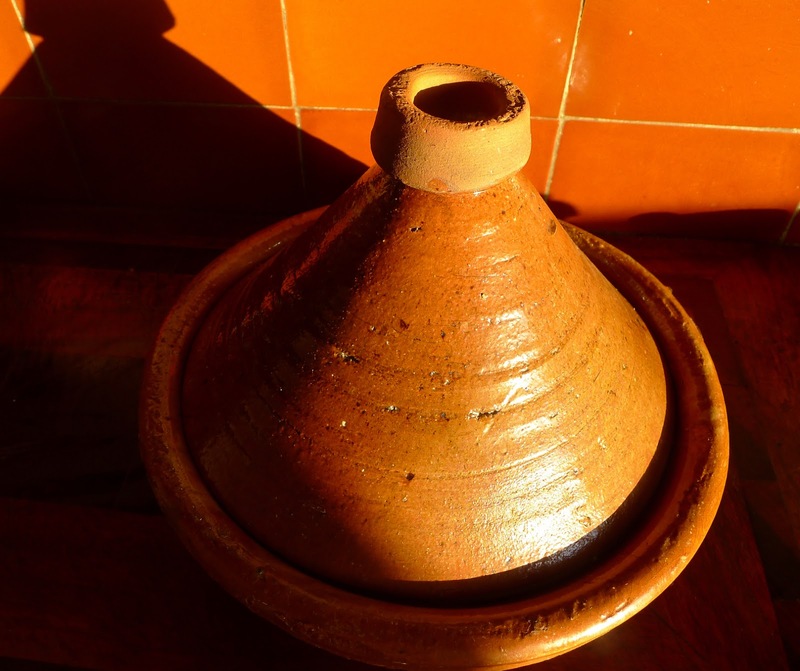 In Spanish cooking, there is nothing quite like the tagine, with its shallow base and conical lid. Tagine—the word is used for the finished dish as well as the cooking vessel—is as much of a cooking process as an object. Foods are added to the tagine without previous browning (no sofrito!). The conical top traps steam and keeps it circulating, resulting in tender food full of flavor. 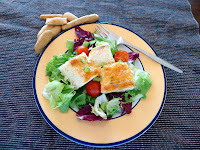 I love the simplicity of layering ingredients—oil or butter in the bottom, then grated onions for flavor and substance. On top, the meatballs or, in my next experiment, chicken pieces. Spices, including saffron, water to partially cover. Covered with the lid and simmered, the food becomes ever so tender while it soaks up the spices. I consulted Paula’s recipe for tagine of chicken with olives and lemons—but I chose to use the method, but not follow the authentic ingredients. 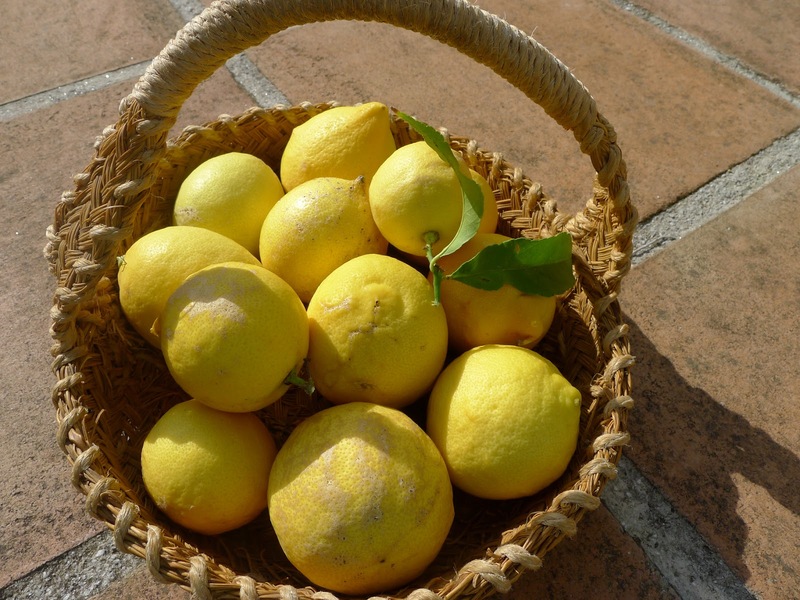 In southern Spain, there are many Moroccan shops where I can buy salty preserved lemons, but I prefer the tart-sweetness of fresh lemons, of which I have lots. I know—this is all wrong. But, I like it like this! The lemons cook down to marmalade consistency. 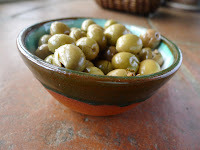 Also, I added my own Spanish cracked, brine-cured olives to give the dish a Spanish inflection. 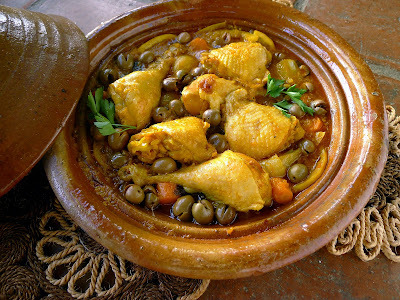 For lots of information about authentic Moroccan cooking, check out Paula Wolfert's Facebook page, Moroccan Cooking. 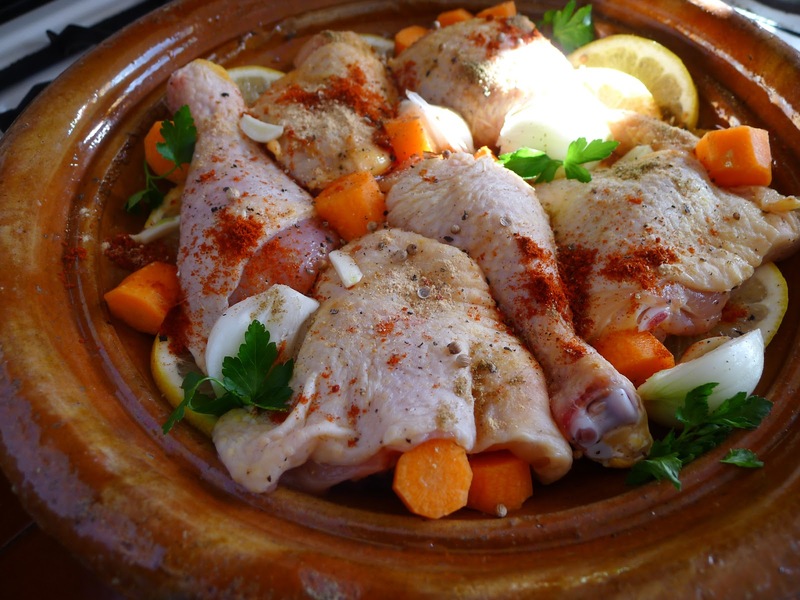 If you don't have an authentic tagine, use an ovenproof casserole with a tight-fitting lid and cook the tagine in the oven. To pit cracked olives, squeeze them and the pits pop out. Instead of carrots, other vegetables can be cooked with the chicken—pumpkin, fennel, artichokes. Taste the sauce when you turn the chicken pieces, if it seems too tart, add a spoonful of honey. Serve the tagine with bread, rice or cous cous. Chicken cooks with onion, spices and lemons. Chicken and spices ready to cook. Put the saffron in a heat-proof bowl and add the boiling water. Allow to infuse for 30 minutes. Sprinkle the chicken with salt and pepper and allow to come to room temperature. Place the oil in the bottom of a tagine. Spread the grated onion on top. Arrange the lemon slices over the onions. Place the chicken pieces in the tagine. Sprinkle with the pimentón, ginger, cumin, coriander, pepper, parsley and garlic. Tuck the carrots and onions between chicken pieces. Pour over the saffron water and remaining water. Bring to a boil, cover the tagine and reduce heat so the liquid just simmers. Cook 30 minutes. Turn the chicken pieces, cover and cook until chicken is very tender, about 30 minutes longer. Remove lid, add the olives and cook, uncovered, 10 to 15 minutes more. Allow to set, covered, 10 minutes. If desired, skim off excess fat from the surface. Garnish with parsley or cilantro. Cauliflower soup with cheese flan and scraps of ibérico ham. In the wake of a party (see my previous post), I’m left with a heap of cooked cauliflower that went into a winter salad, a pot of black-eyed peas (the vegetarian option had no takers) and even some patatas a lo pobre. I’ve also got quite a lot of ibérico ham remaining—but that does not fall into the “leftover” category, as we shall easily finish it in a week or so. I served the potatoes reheated alongside a roast chicken and stashed the black-eyed peas in the freezer. Dressed with olive oil and Sherry vinegar, they make a wonderful side dish for partridge or quail,. Now, what about the cauliflower? It doesn’t freeze so well. Soup? Yes! But, with an embellishment, a savory cheese flan. The recipe for the soup and flan comes from my La Mancha cookbook, COOKING FROM THE HEART OF SPAIN—FOOD OF LA MANCHA, so the preferred cheese is Manchego. Manchego cheese is made only from the milk of Manchega-breed ewes and is aged a minimum of 60 days. For the flan, a cured cheese is best. Cheese flan baked in a loaf pan. I used leftover cooked cauliflower in the soup, but you can start with raw as well. Use regular sweet pimentón (paprika) or, for interesting flavor, pimentón de la Vera, smoked paprika. I garnished the soup and flan with scraps of that tasty ibérico ham. 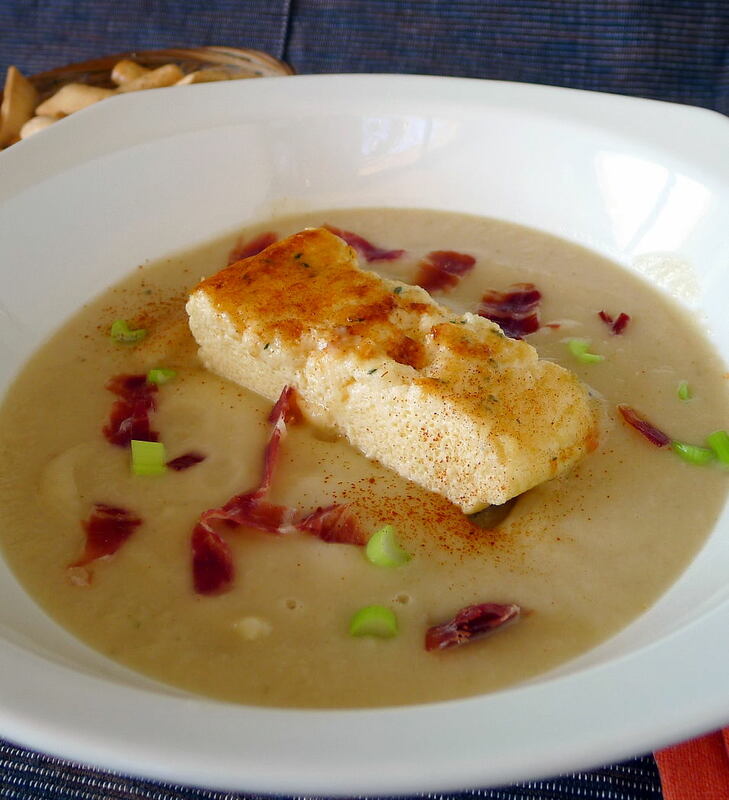 You can make it a vegetarian meal by using water instead of chicken stock and omitting the ham garnish. The flan might also be served on its own as a starter, with salad greens and vinaigrette. 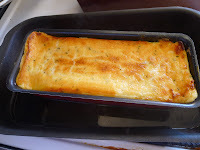 Combine the eggs, milk, cayenne, thyme, salt, flour and cheese. Pour into an oiled 6-cup loaf pan. Cover the pan with foil. Place it in a larger pan and partially fill with boiling water. Bake until a skewer comes out clean, 45 minutes. Remove foil and bake 10 minutes more until the top is golden. Heat the oil in a soup pot and sauté the onion 5 minutes. Remove the pot from the heat and stir in the pimentón, cayenne, and cumin. Add the potatoes and cauliflower to the pot with water. Season with salt, pepper, bay leaf and vinegar. Bring to a boil and simmer the soup, covered, until potatoes are tender, about 35 minutes. Remove bay leaf and let the soup cool slightly. Puree the soup in a blender or with an immersion blender. Reheat the puree gently. Cut the cheese flan into slices and lift them out of the loaf pan with a spatula, discarding any accumulated liquid. 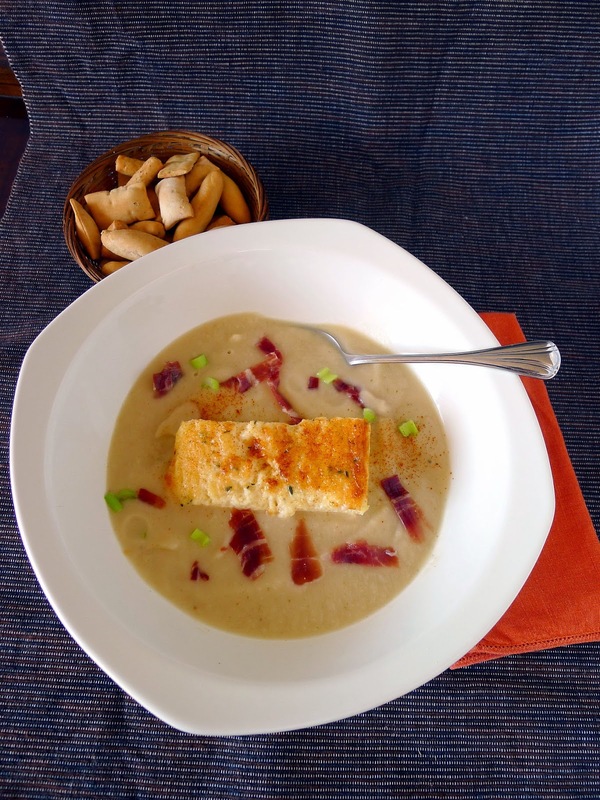 Place a slice in each soup bowl and ladle the soup over. Garnish with scallions and ham. January sunset, North Africa on the horizon across the Mediterranean.